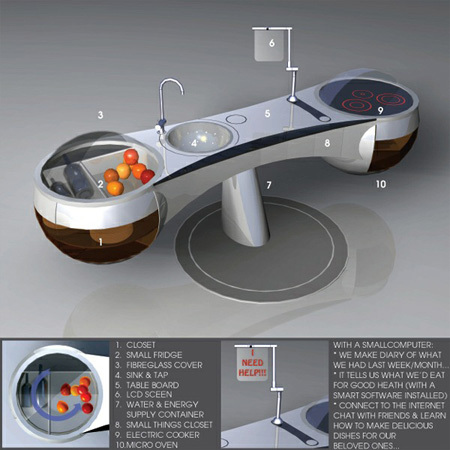 Tomorrow’s kitchens may be radically different from the ones we have now. They need to be space-saving, sophisticated, and more than anything, be kind to the environment. 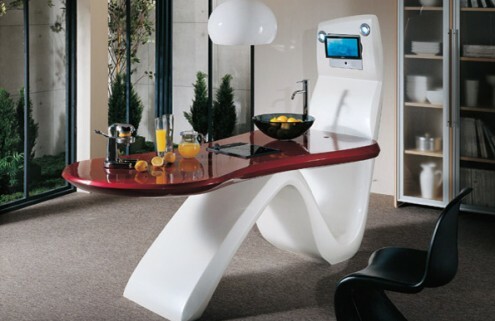 Take a close look at these kitchens of the future for you may be using one sooner than you expect (Especially since some of them are already out on stores!). 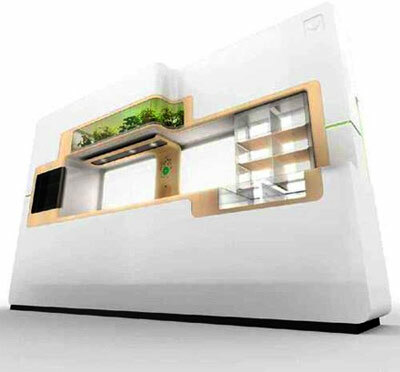 The above kitchen (designed by Cheng He, Liu Guang Kui and Zhou Dong from China) was the winning design at “Kitchen is heart of the home”, a kitchen design contest organized by DesignBoom where 2980 designers from 102 countries participated. Sow how does it work? Here is the description from the designers themselves. (1). Creating the new concept of happy kitchen: Sharing the joy with relatives and friends face-to-face. (2). 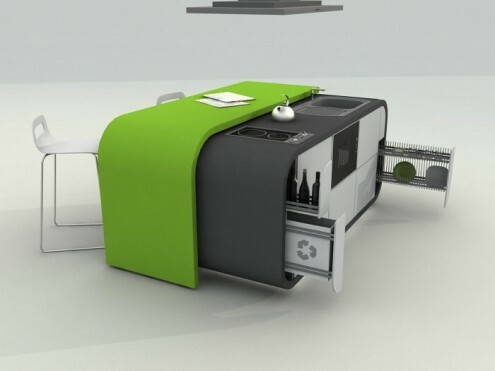 Cupboard adopts double-deck rotator structure, can rotate 180°respectively, the three major work center of washing, mixing and cooking can rotate in the front of the operator, let “zero” distance in each workflow; And can lift in certain distance in order to be suitable for the different operator. (3). Flume has two kinds of outlets: The parallel water outlets of induction type lie on both sides of flume; The holding type faucets with metal hose lie in the middle of two flumes, that can be suitable for operating under various environments. (4).Abandon the board type, slide rail and hinge of the traditional cupboard completely. This cupboard regards the structure frame of aluminium alloy and the combination of stainless steel pipe as the integer structure. Adopt level bearing, hydraulic pressure system, shutting system to realize lifting of cupboard and wall cupboard. (5). 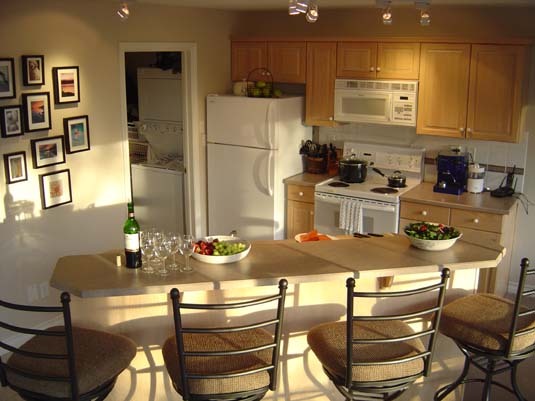 Integrative structures with operational table-board, flume and kitchen, cupboard distribute icebox, disinfector and oven symmetrically, other borders are closets. (6). Lower cupboard is drawing structure, can pull out wholly while using, and make the operation simplify. Hang the kitchen ventilator under the top cupboard with function of illumination. 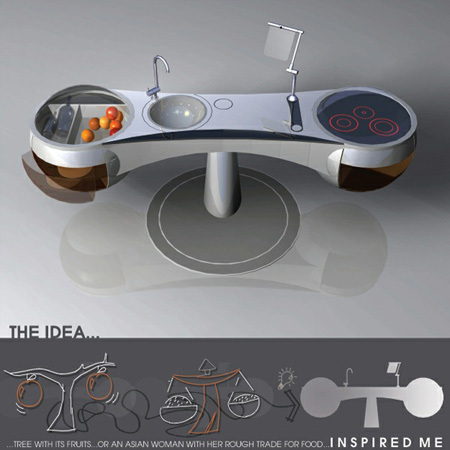 Here is another concept kitchen designed by Hieu Tranngoc and Hao Tran from Vietnam which drew inspiration from the shape of an apple tree with fruits hanging from its large branches. It incorporates a closet, a small fridge, an electric cooker, and the microwave oven the two large fruits hanging from the two branches. Additionally, there is provision for mounting an LCD monitor if you are into browsing while you cook. At first glance, Lebrun’s design looks more like a kitchen garden than the actual kitchen. 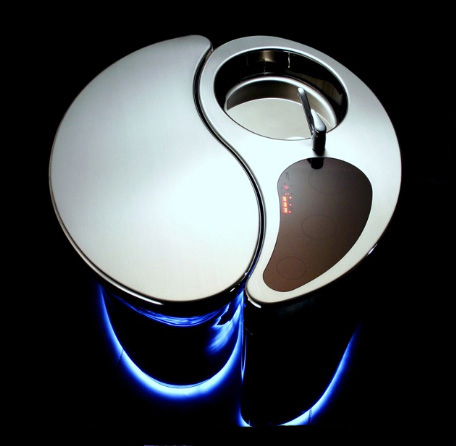 But that is before you get to know that the panel can be opened to reveal a workspace, cooking surface and sink. The plants on top are specialized ones that were developed by the aerospace industry for their filtering and cleaning properties. They provide a renewable supply of clean water and vegetable soap. 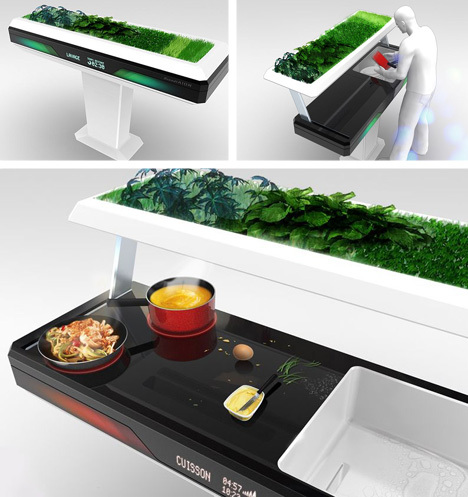 If you are conscious of conserving space, you will like this design by Fevzi Karaman which packs nearly everything the kitchen needs in one sleek module. 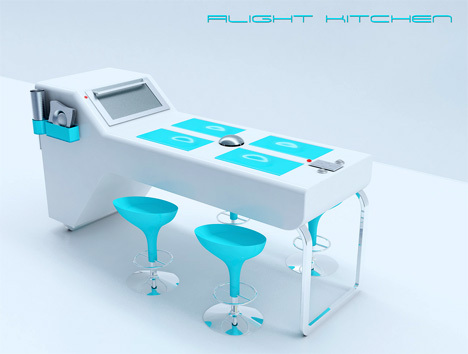 Alight kitchen from Altera Design Studio is an award winning design at the Incheon International Design Competition 2007 and it hosts a number of features. Only ready-made food and beverages are consumed in sheet-metal packaging so people will be conscious about what and how much they eat. Food and beverages packs will be kept inside the cooling unit of the system. 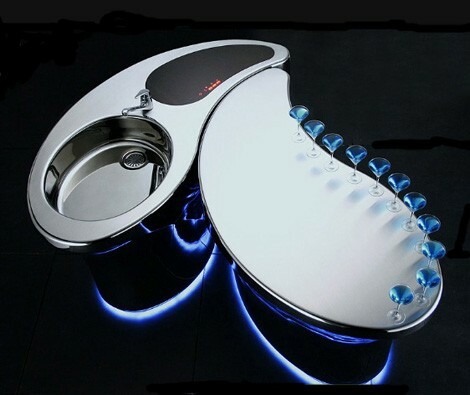 It only allows storage of 3 days’ worth of food. A Smart oven warms up the food in groups to minimize how often it’s used. It arranges the ideal time and temperature for the packs by reading their barcodes. There are 4 hollow plates located on the main dining table. 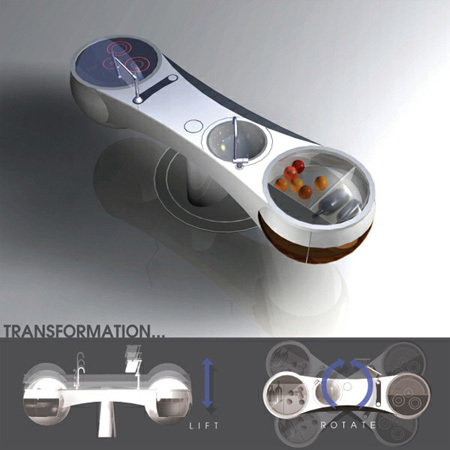 Each of them can rotate on its center-axis so you can eat on the either side of the plate. The center of the table houses a small flatware station. 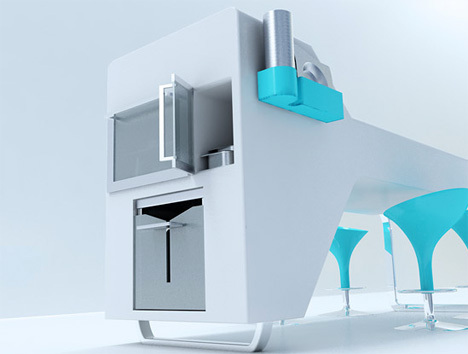 The integrated dishwasher conserves water by filtering and reusing previous wash water. 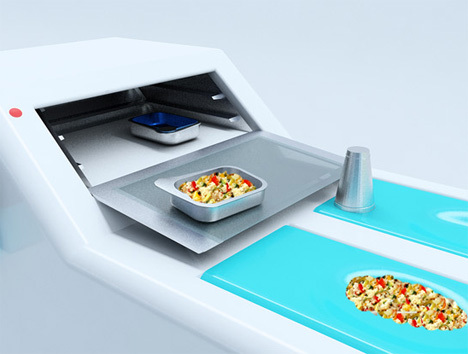 All plates are stored underneath in their own compartments. Whirlpool’s ‘green kitchen’ is a concept that pays a lot of attention to reduce wastage by diverting 60% of the water and heat generated from itself to fuel other appliances or functions in the kitchen. For example, it uses the heat from the fridge compressor to produce hot water for the dish washer. Okay, so far we showed you kitchens that are not in the market yet. But those below are already out. 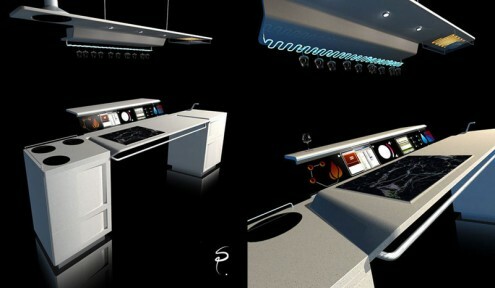 For example, this tech kitchen from designer Sebastien Poupeau is height adjustable, music enabled and web connected. Who says the kitchen table needs to be rectangular? 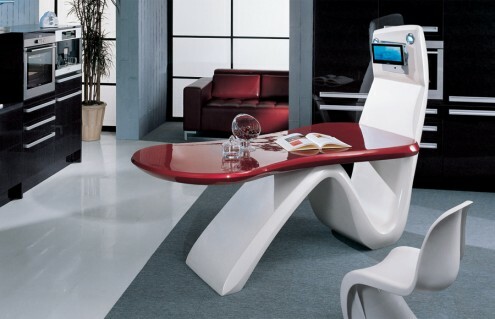 Not Enex… Their curvilinear design breaks away from the conventions and the kitchen seems to be taken right out of a Sci-Fi flick! Built in entertainment system seems to be a nice touch too. This unit from Tokyo Kitchen can be arranged in a variety of ways depending on your space. 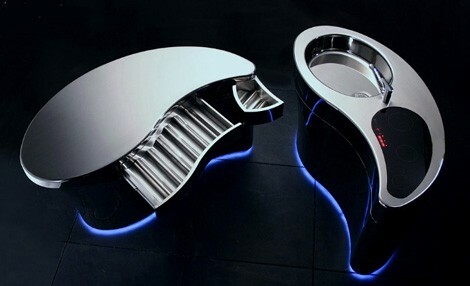 It is aesthetic and functional with three electric cooking rings, a generous circular sink and plenty of space for storing kitchen items. Howdy, I really enjoyed this post. I’ve just started up a website and making somewhat diverse articles for it. Do you mind if I blog something about this? Of course I will provide you and this site full acknowledgment and place a link to this page , thank you. Howdy, I really enjoyed this post. I have just started up a blog and began to create somewhat varied content. Would you object if I blog something about this? Obviously I will give you and this post full credit and place a link to this page , thank you. I want to say that I definitely like your website, just discovered it last week but I have been following it since then. Good blog, many fascinating information. I believe four of days ago, I have visited a similar blog. Does anyone know how to track future posts? It is simple to see that you are passionate about your writing. Great job! I’m happy !It is simple to see that you are passionate about your writing. Looking forward to future posts.Thanks!